Europe's Austerity Plans Face Growing Backlash In Greece, the politicians can't agree on a new government. In Spain, the health of the banks is in doubt. Europe's austerity plans are generating increasing opposition, and the Continent's economic crisis appears to be growing more urgent. Spanish protesters gathered in Madrid on Saturday as the country's economic problems continued to worsen. The country's banking system is seen as particularly vulnerable. In Spain, the health of the banking sector is in doubt as street opposition to painful budget cuts continues there and in other parts of Europe. Tens of thousands took to the streets in Madrid and several other Spanish cities in peaceful protests against deep budget cuts and other austerity measures. In downtown Madrid, Jose Antonio de le Gala, a 28-year-old physician, watched from the sidelines and lamented the painful fallout from the real estate bubble that burst. "Most of people thought we can grow forever, and that's not possible," he says. "If you grow, there's a moment that the economic situation is going to stop, or is going to go wrong. For years, most of the people has lived in a way that they couldn't maintain." In Germany, Chancellor Angela Merkel's conservative CDU party took another hit in regional elections this weekend. The eurozone is the Titanic and they just struck an iceberg and they haven't realized how profoundly damaged they are below decks. This time the loss was in the country's most populous state, North Rhine Westphalia, where the CDU's share of the vote was off more than 8 percent compared with 2010. The big winners were the Social Democrats and the Greens. The emboldened opposition is now likely to press for new growth measures to compliment Merkel's strict austerity prescription. In Brussels, EU finance ministers are meeting, with Greece, Spain and the deepening eurozone crisis topping the agenda. Senior European politicians have kept up a steady stream of warnings for Greece to make good on its deep cost-cutting pledges or risk an exit from the euro. 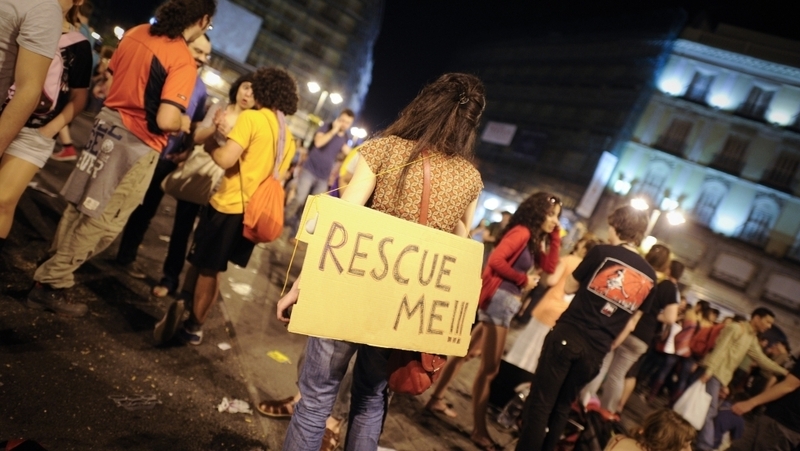 "I am very concerned about the situation in Greece. This is a defining moment for the country," said European Council President Herman Van Rompuy. His comments only seemed to highlight a growing disconnect between the official thinking in Berlin and Brussels and what's actually happening in Athens and Madrid. Greeks voted overwhelmingly for parties that have vowed to fight the budget-cutting program. Polls show parties opposed to austerity would do even better if a new voting round is needed, which seems increasingly likely. Former IMF Chief Economist Simon Johnson, now with the Peterson Institute for International Economics, says the loud political and popular backlash against austerity shouldn't mask the reality that the Greeks — and the currency bloc — are in serious trouble. 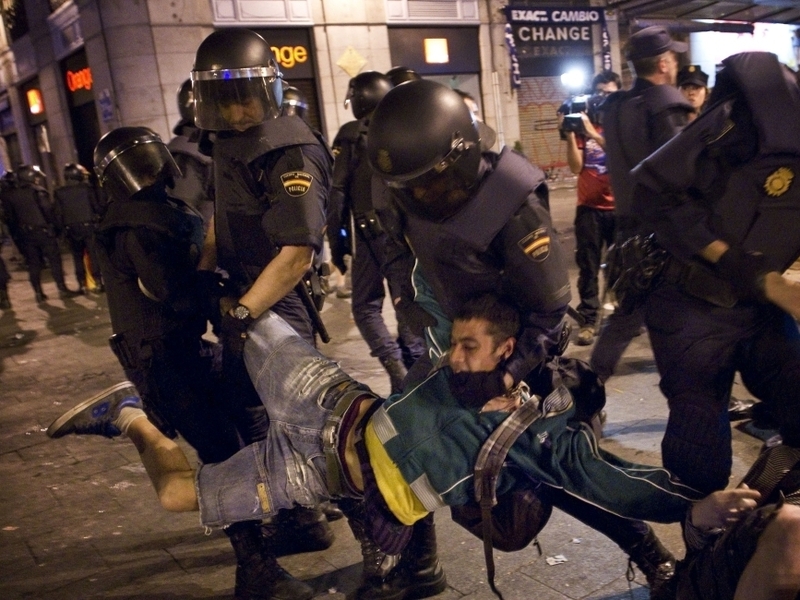 Spanish police officers carry off a demonstrator as he and others are evicted from a square in Madrid on Sunday. "The European Union and the eurozone is on the brink of a total disaster [of] which Greece, by the way, is just the beginning. It's just the tip of the iceberg, if you like," Johnson says. "The eurozone is the Titanic and they just struck an iceberg and they haven't realized how profoundly damaged they are below decks." Gloom was the order of the day. The German magazine Der Spiegel reported that the EU is exploring how to provide funding for Greece even if it leaves the eurozone. The goal would be to limit the financial contagion and keep it from devastating other countries in Europe. "I'm not sure now what you can do to save Greece. That sounds terrible but sometimes countries need to default," says Mark Hallerberg, who directs the fiscal governance center at Berlin's Hertie School of Governance. Once again the big fear, Hallerberg says, is whether a Greek exit from the eurozone would spark panic and drag down the larger troubled eurozone economies — and perhaps the entire currency union. Or, will the firewalls, which the EU insists are now robust — prove adequate? "The issue is does it spread to Italy, does it spread to Spain? The worry I think now is especially in Spain," says Hallerberg. "The third-largest bank in Spain is being partially nationalized. There are rumors of all sorts of additional problems. And the question is maybe there is enough fuel in Spain now that the fire will get over and catch there." Tuesday night, incoming French President Francois Hollande, who opposed the German-led austerity during his campaign, travels to Berlin to meet Merkel. He is expected to push for new measures to boost economic growth. Merkel insists such measures must not increase total debt.